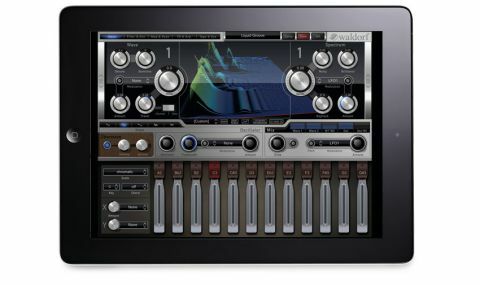 At this price, it's a total steal for any iPad musician. Now, how about a desktop plugin version, Waldorf? Takes wavetable concept to new level. Looks great. Sounds better. A collaboration between Tempo Rubato's Rolf Wöhrmann (developer of the excellent NLog synth), Waldorf's Stefan Stenzel and synth design luminary Axel Hartmann, Nave is a hybrid wavetable/analogue synth that serves as a dazzling testimony to the power of the iPad as a synthesis platform. "Nave genuinely takes the wavetable concept to places it's never been before"
It genuinely takes the wavetable concept to places it's never been before, and its five pages are so packed with stuff to play with that it could have easily got out of hand were it not all laid out so logically. Nave generates its tough, edgy sound using two wavetable oscillators and a virtual analogue oscillator with up to eight unison voices available to it via the Überwave section. Loosely speaking, the analogue oscillator provides the 'beef', with the wavetables handling the rest of the sound. And what wavetables they are! You can choose one for each oscillator from the extensive factory list, load in any WAV file you like (the results of which are never predictable), or type in text to convert it to a speech wavetable - we can see this becoming the next big vocal processing fad. The 3D display is informative, visually stunning and highly customisable, with an edit mode that you can easily lose hours in. Controlling playback of the two wavetables is made easy by the well-organised controls, although we're a bit disappointed that modulation of the 'playhead' isn't animated - manual scanning of the wavetable is, however. Ring modulation can be introduced between the two wavetables and Osc 1/W1, while a delicious multimode 12/24dB filter is on tap alongside a host of further modulators, an excellent four- track recorder and so much more. To appreciate the ingenious distillation of a potentially terrifying instrument that is Nave, you really have to try it yourself. If Waldorf had built this as a hardware synth (which not that long ago would have been wholly justifiable), it would have cost thousands.